chibiyuuto has a new layout! With this, I’m debuting a new structure (sort of) for my LiveJournal. The top banner will from now on feature the next CLAMP’s biggest event/release and it’ll be updated regularly (as the news get old). That way the latest big CLAMP news will stay at the top of the page until another one tops it. I’ve seen several times people leaving comments saying “What? Kobato. will have an anime?”, when that news was posted two weeks ago or more. This way you’ll know what CLAMP’s biggest news are regardless of how old they were announced. I’m not gonna make a new post every time there’s a new banner, because that will be spamming, so you don’t have to worry about that (unless, of course, there’s something worth mentioning). Once again thank you for visiting this journal! Wow, Alex, it looks so professional, wonderful! It looks great! Your web design skills are remarkable. There is one thing, though: would it be possible to switch the orange of the widget for other colors? I can’t help but think that it would look better if the highlighted news items were in the same reddish-magenta color as “Chibi Yuuto’s CHRoNiCLEs.” Of course, I don’t know anything about making widgets, so changing colors could be much more difficult than it sounds. >would it be possible to switch the orange of the widget for other colors? I thought about that. It isn’t hard to change its colors at all, but since this widget is being used by a few other websites, I wonder if that won’t be a problem… I promise I’ll think about it, thank you for your suggestion, it makes a lot of sense! You know what? I just updated the colors \o/ I think it looks much better like this, thank you! \o/ I’m glad to have helped! I always thought that that widget was so cool. By the way, are you going to Japan Expo? I still don’t know if I can make it or not =/ Are you going? Really? That’s so cool! That means your booth is listen in JE’s website? What is its name? xD What kind of stuff will you sell? Congrats! Good luck on that! What does C&M stand for? Thank you! It’s going to be fun, especially because I’ll meet my best online friends. That’s my intention! XD LJ is just the platform, I really want to make it look like a website xD Mission accomplished! Yes I have! But why wordpress, precisely? LJ is where the entire CLAMP fandom is at xD Sugee is wordpress? I see! *takes a peek on sugee* Yeah, I see a lot of interesting adds ons in there. Whenever I think on moving out of LJ (that is, if that ever happens for some reason, because I don’t actually consider it unless I’m forced to do it), I always thought that WordPress would be my new home due to its flexibility (and somehow similarity to LJ too). One thing I wanted to do but LJ didn’t allow me is to place a SWF Flash file at the top, as the “banner”. Does WordPress allow me that? But I saw sugee is on http://kosciuk.net/ domain. How do you do to “import” (is that the word) wordpress into that? Ah you update a new layout again, so cute especially for clamp. IT LOOKS GORGEOUS! I fell in love with your new layout chibiyuuto-san, its one of my favourites too! That’s enough for me xD Thank you! 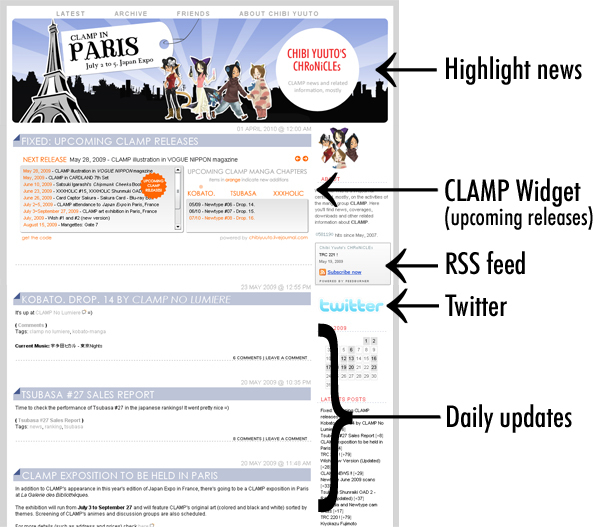 Not to trouble you though, but the widget I think is pushing the entries down again in IE 6. Oh shoot, I forgot about that! I downloaded a IE 6 simulator and now it’s fixed =D Sorry for the trouble! And thanks for letting me know!! I also didn’t realise you had a Kobato. fansite, so I’ve just visited that and clicked on everything! That site looks wonderful, too! It looks wonderful dear! And the banner is cute!! And the red color for the Clamp Widget fits much more ! Really, that’s gorgeous ! Congrats and Thanks for your hard work ! Lol! I love it! It really is a great idea and you are as talented as always! Oh, and I love you new icon too!! I was out for the weekend, but goodness, I was surprised when I logged on here to check for CLAMP news. Great job, CY. Really, it looks great. PS.Not only Clamp will be present, but my beloved Yui Makino will also be present there..I wanna GO! Really really neat and pretty!